"Senate Democrats have confirmed only 48 of the 197 presidential nominations. They can not win then all they do is slow things down and obstruct! "" Eventually, but at a late date, so we can start early, Mexico will somehow pay for the much-needed border wall. " However, Mexican President Enrique Peña Nieto has denied that he will take any penny from his country to bear the cost. In October, workers began building prototypes of the wall between the two countries. One of the most controversial and criticized decisions of the Trump government was the sudden departure of FBI director James Comey on May 9. After firing him, the tycoon stated several times that he was not being investigated in the process on Russia interference in the elections. Trump made a mistake and posted on his account that was, yes, being investigated. "I am being investigated for firing the FBI director by the man who told me to fire the FBI director! Witch Hunt. 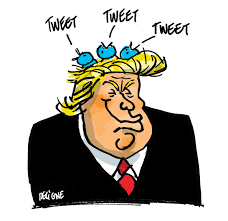 "After several criticisms by the press of his behavior and behavior on social networks, Trump made a point of publishing a tweet to say what he thinks about his habit. "My use of social media is not presidential - it's the PRESIDENTIAL OF MODERN TIMES. Make America Big Again! "In addition, he took the opportunity to make fun of a typo that became famous:" Covfefe ". Trump unwittingly sent a badly typed tweet and the rebound was immediate even though it was deleted. "Who can guess the real meaning of" cofever "??? Have fun! "During this year, Trump also remained silent on the expansion of North Korea's intercontinental missile tests and the threats of dictator Kim Jong-il. In April, he went on to say that the country "was looking for trouble". "North Korea is looking for trouble. If China decides to help, it would be great. If not, we will solve the problem without them! USA, "he wrote. Although South Korea's President Moon Jae-in has come up with a more approach to dialogue with the North Koreans, Trump calls for economic and military sanctions." North Korea has just launched another missile. Does not this guy have anything better to do with his life? "He tweeted. The president of the United States even commented that the Chinese government's efforts to persuade North Korea to change course regarding its nuclear and missile program had little effect. In the message, Trump still referred to the North Korean leader, Kim Jong Un, as "Little Man of the Rocket". "The Chinese envoy, who has just returned from North Korea, seems to have had no impact on the Rocket Man," he wrote. Concerning the violent clashes during a white supremacist march in Charlottesville, Virginia, Donald Trump condemned all actions that represent hatred and called for the union of the Americans in a "vague" tweet. "We must all be united and condemn everything that represents hatred. There is no place for such violence in the United States. Let's unite as one, "he wrote. One of the Republican's most controversial latest posts was the sharing of three anti-Muslim videos that were originally posted by a leader of a British right-wing party. British Prime Minister Theresa May has repudiated the US president's attitude. One of the videos shows what would be a group of Islamic militants killing a man. The other shows an alleged Muslim immigrant beating a Dutch boy on crutches. The third video shows a man who would be a Muslim destroying an image of Our Lady. In 2017, the tyrannical use of tweets by the tycoon was an issue that gained importance, mainly due to controversy that tech giants such as Facebook, Google and Twitter became involved during the year for the supposed involvement in the Russian ad purchase operation to spread disinformation among the voters in trying to influence the presidential election of the United States.